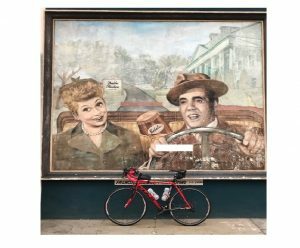 If you enjoy cycling and viewing public art, you will enjoy cycling around Culver City, California, also known as “The Heart of Screenland.” If you didn’t already know it, Culver City is where Hollywood movies are really made. Mural location: Southeast corner of Culver Boulevard and Irving Place. Artist, Francious Bardol commissioned to paint this 10′ x 12′ mural in oil paint.